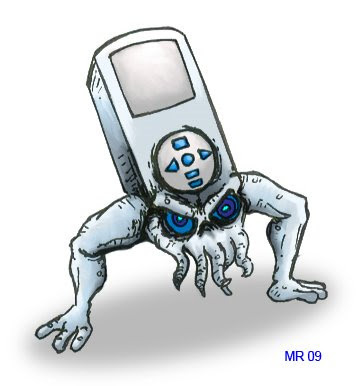 A tsukumogami evolved from a popular brand of mp3 player. He's small and difficult to use, but everyone likes him because he's stylish. The ridiculous wheel thingy used to actually select songs is so counter intuitive you're better off just leaving him on shuffle and hoping what you want comes up. He is personally responsible for causing untold traffic accidents as people fiddle with this labyrithine interface when they should be paying attention to the road. He could just have one button to select the next damn song, but that would be too easy. He also likes taking all of your legally owned mp3s that you ripped from your own legally purchased CDs and slapping them with his own brand of digital rights management so that you can then on only place them on a limited number of machines. He then forces you to buy the same music at a lower quality with the same draconian restrictions imposed. He does this because he can. Yes, he is truly evil, and should be stomped out of existence.